Greetings I am here, I am Archangel Zadkiel, I come now connecting with you on all levels through these words and also energetically to assist you in becoming free. By dropping into and opening your heart, you will be able to feel my presence and unconditional love, which I surround you in now. Breathe deeply, and focus inward, open your heart, and feel for yourself this love surrounding you. You are well aware there is a great deal of change happening on both your earth and within you, the amount of light that is pouring onto your Earth has once again increased. And while this is good, and know that it is assisting you in your highest calling which is your opening up and your reconnecting with your soul, know that it is bringing up that which is not in line with your truth to once and for all be released. Do not meet anything or any emotion that you encounter in your reality with shock. Reality is being shaken up, know that change is happening for everyone. Know that if you find yourself feeling sad, feeling angry, depressed, lonely, upset that this is an emotion that is simply out of alignment with the truth of who you really are and so it is coming up for you now for it has been suppressed and pushed down beneath your radar for too long. You see, when you refuse to deal with something when you suppress it and bury it within¦. It doesn't actually go away. It is simply buried, under layers and in many levels and then more hurts and emotions that you do not feel ready to deal with are piled on top. So now, you have layer after layer of these negative emotions and issues that are simply not serving you, that need to be released. Light is pouring onto Earth, serving you in this process of release. Pain that comes up for you, it is coming up for one reason and with a distinct and clear message, release me! In releasing it is important for you to connect with the cause of the emotion. What emotions are you feeling, first off allow yourself to feel them. Then ask yourself Why am I feeling this? Is this tied to a past memory from your current expression, possibly a past relationship, a job or some action you did or did not take that you are still blaming yourself for. Ask yourself… What am I feeling and why? Identifying these two things allows you the opportunity to release. Fully feel the emotion that has come up for you, allow it to be present with you in the moment and then when you are ready ask your angels to lift it out of your body and into the light… Always release emotions right into the light so that they do not come back and latch on to you again, and so that they do not enter into and torment another. Release the emotion into the light where it will be dissolved into this unconditional love energy of white light and reuniting and reconnecting with source energy to once again enter into your atmosphere into your earth as pure light with the purpose of service in, yes releasing that next layer. Many of you have been feeling overwhelmed as one thing after another is coming up for you. Know that as you keep going in your releasing, you are getting to those core issues, those key issues that have been pushed down years ago buried and repressed so deep within you that you have almost forgotten about them yet they are still adversely affecting you in many areas. Deal with these emotions now when they come up for you¦ once and for all. You truly are ready in this light, in your life, to step into your true enlightenment and your full embodiment of Christ consciousness. Step into you full knowing and experiencing all of your multidimensional selves and experiencing the truth of your Highest Self. You are ready for this powerful connection and you are moving into alignment with this. To step into it fully, into a state of pure compassion, love and peace, you must be willing to release past hurts. 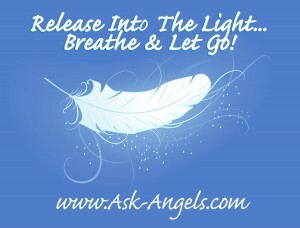 Feel and identify what is the emotion, why are you experiencing this, what is it tied to and then ask for your angels to take it from you releasing it in to the light, dissolving it into the light of love. It is then good to replace this emotion, this hurt, doubt, anger, grief, and guilt, whatever it is replace it with truth, with unconditional love and with compassion with oneness. When you do this, you claim what is rightfully yours! Unconditional love, peace, joy, bliss, abundance, this is who you are. Release anything that is not love; replace it with love¦and step forward confidently in love knowing that as you do you truly are able to ascend into the higher realms to begin to live your heaven on earth. To then be able to serve humanity and your planet in this process of ascension and evolution. This is what you are here on Earth to do. As you release that which no longer serves you are able to truly connect with who you are with your higher self with your divine energy. As you do this you shift the collective consciousness, the scale is tilted and your fellow human being who is unconscious, not knowing that there is more than the 3rd dimension not knowing that they are loved and that they are divine¦ will begin to experience a shift in their own life, this is the blessing of the light that is surrounding and pouring onto earth stirring energies up at this time. Yes it is stirring up darkness, yes it is stirring up pain for many but this is good and this is necessary and as you act and release these emotions that come up in you, you enable yourself to serve others and step onto your true path and into your true power, do this now. You are supported! You have guides and you have angels, designated specifically to work with you. All angels are willing to assist you. Ready, willing and able, call upon us, connect with love, and reunite with your truth by releasing anything that is not. Thank you for the message.God bless! Thanks very much melanie for sharing!! i had to say kindly i was very glad for that,but my body said no. Thank you for that. I so needed to read it to remind myself to let go of all that no longer serves, into the light remembering also to forgive myself for my negative emotions that are coming up. I can so easily beat myself up for having angry thoughts not knowing that it is a natural part of the process for them to be released.